I’ve written many articles here at ‘Aussie Pete’ about my life in Singapore and ‘milestones’ that my family has achieved here in the last three years. 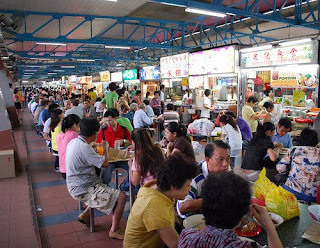 Whether it be blogging about eating the country’s mouth-watering infamous black pepper crab at ‘Long Beach @ Dempsey’ or reporting on the process for the birth of our baby in 2007 at Mt Elizabeth Hospital, one thing has become extremely clear to me of late… in all my writings, I’ve been taking my lifestyle in Singapore for granted. As the old Dr Demento song goes, life here really is “wonderful all the time”… but don’t get me wrong - Singapore is definitely no ‘funny farm’. The very high standard of living is extremely attractive to foreigners when it comes to living, studying, working or playing in Asia. It is also something that all locals can be (and are) extremely proud of. I digress (as I often do when it comes to food) – my safety late at night is by no means an accident… the crime rate in Singapore is extremely low (in fact, one of the lowest in the world), and it is widely regarded as, and statistically proven to be the safest country in Asia. This is great news for my son (now two years of age). Combine this safety with the world-class medical system and the proven track record in education, what better place to raise children? I receive emails almost on a daily basis from people all over the world interested in travelling to Singapore (for a variety of reasons) who want information on where to go, places to stay, how processes work, and even just to ‘pick my brains’ on my experiences living in the vibrant heart of Asia. Without fail, I always respond to these emails, and as best I can I gladly share my experiences and knowledge (as limited as that may be). Now for a real bombshell!! I have come across an online ‘Gateway’ to Singapore… live, work, play, study – all the details there in one spot. A website that provides more than just information (although there’s a ton of that), the portal is fun, entertaining and above all, extremely easy to navigate. Not usually one to ‘push’ my readers, but I encourage you strongly to visit the gateway and navigate the site – you will truly feel rewarded!! I intend to give the ‘Gateway to Singapore’ portal a real plug and work-over in the coming weeks (it really deserves it), so be sure to continue to visit ‘Aussie Pete’ daily and see what is being featured (perhaps even share in some great prizes) – I’m sure that those who have not been to Singapore before will be enlightened, and those that have and those that live here, may even learn something that they didn’t know before about life being “wonderful all the time” !! great job, Pete... I'll be relocating my family to SG early in January. Will be picking your brains and looking at the Gateway you shared before then. Cheers. Steve - mate, feel free... drop me an email anytime and I'll try to be of help!